The other day I did an interesting observation of a long-tailed skua. I was on my way back to the station after checking some fox dens as I saw the bird with something big in its bill. I soon realised that it had caught a collared Lemming, so I approached slowly after getting the camera ready with the long lens. It let me come very close without seeming to get nervous. 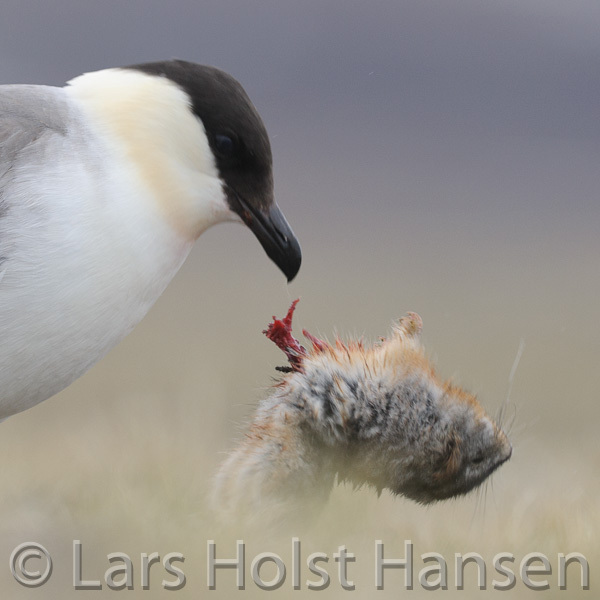 The lemming was still pretty much intact but while I was photographing, it managed to get it open by holding it with its sharp bill and kind of throwing it towards the ground, using the weight of the lemming. It then started to eat the intestines of the rodent. When a glaucous gull flew past, the skua immediately dropped the lemming on the ground and started to walk around pecking "at insects" and minding its own business... but as soon as the gull had passed the skua quickly went back, grabbed the lemming and flew off with it to the other side of the river. On the other side of the river there are a lot of musk oxen gathering. Some of them looked like they would like to cross yesterday but did not dare. On this side a bull and a young female are lying right next to one of our plots. Tomorrow, I try to persuade them to let me do the check of plants and measuring of greenness. Otherwise musk oxen numbers are steadily increasing in our census area with 44 individuals recorded from the roof top yesterday.